It only sounds like euphemism for *ahem* “self-pleasure.” In fact, How to Train Your Dragon is a surprisingly enjoyable lark of a film. Jay Baruchel voices Hiccup, the frail son of Viking leader Stoick (Gerard Butler). Their village is a comically cruel place cursed with constantly coarse weather conditions and frequent dragon attacks. In fact, dragon fighting is something of a cottage industry. Hiccup longs to fight and kill the beasts as it is guaranteed to increase his popularity, earn the respect of his father and win the heart of dragon-slaying hottie Astrid (America Ferrera). When one of Hiccup’s inventions wounds a Night Fury, a dragon so fierce and elusive that one has never been killed, he tracks down the fallen beast in order to strike a death blow and claim his rightful place in history. But, once face-to-face with the creature, will he possess the steely determination required to kill the monster? Let me give you a hint…there’s a reason it ain’t called How to Taxidermy Your Dragon. The dragon, whom he names Toothless (presumably for the same reason big guys always seemed to be nicknamed “Tiny”), is initially as distrustful of Hiccup as Hiccup is afraid of Toothless. However, he slowly gains Toothless’ trust through patience and food while simultaneously studying dragon habits. (Think The Iron Giant meets Grizzly Man.) Back at home, Hiccup begins to excel at dragon fighting school by incorporating lessons learned from his studies to quell the dragons without harming them. And speaking of studying your enemy…DreamWorks Animation recent outings seems to have learned a valuable lesson from Pixar, namely keep the pop-culture riffing to a minimum and focus on storytelling. It’s a lesson that has served them well. 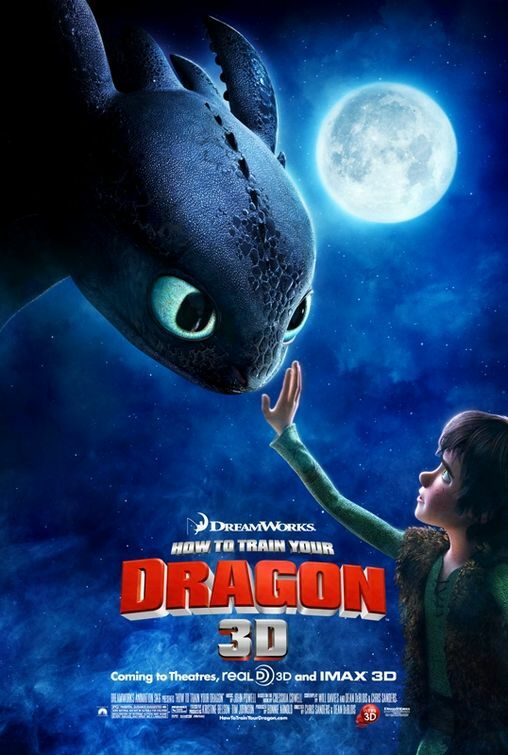 The heart of the movie is the relationship between a boy and his dragon, and the filmmakers are smart enough to allow this bond to develop organically. There is no “pulling a thorn from his paw” moment that creates instant kinship. Instead their connection is developed methodically through small acts of kindness. As their friendship strengthens, Hiccup grows increasingly conflicted. Society tells him to kill dragons but he recognizes that there are many things to learn from them. (I think this would be a good time to say thanks to PETA. You’ve anthropomorphized animals so much that we’re not even allowed to have fun killing fictional, murderous, fire-breathing ones.) As stories go, How to Train Your Dragon’s is a fairly rudimentary one. For all its medieval trappings, it’s essentially the tale of a boy and his dog. But the filmmakers smartly chose to have non-speaking dragons. The creatures aren’t comic relief nor are they smart-mouthed sidekicks; they have a very real sense of menace. There are numerous types of dragons in this world, each variety richly and uniquely detailed. And while Toothless does have the ability to be “cute,” it’s never at the expensive of toughness. Things do get off to a bit of a slow start but the movie finds it footing once Hiccup and Toothless meet. And, as is de rigueur with kids’ movies these days, the story climaxes with a clichéd lesson about tolerance. Not that “tolerance” is a bad lesson per se, but at times it feels as if it’s the only moral animated films feel capable of imparting. Where the film truly excels is in its scenes of flight; extensive, extended and (most importantly) exciting sequences of Hiccup learning and mastering dragon flight. The animation is lush and beautiful as they capture the joy of flying and the fear/adrenaline rush of (almost) crashing. 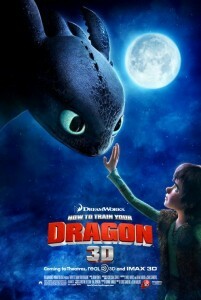 These moments, combined with the nearly wordless scenes of a boy and his dragon bonding, are the highlight of the film. On a scale of 1 to 10, with 10 being The Iron Giant and 1 being Dungeons & Dragons, How to Train Your Dragon gets an 8.